Are Your Teeth Really Stained? First, you need to figure out what is causing your yellow teeth. In some cases, your teeth might have a yellow tint to them as your natural color. Not all teeth start off as bright white, and some people's natural tooth color tends to be more yellow than white. You can usually determine if this is the case for you because your teeth will all be the same color. If your teeth vary in color or shades of yellow, then they are probably stained. Tetracycline, an antibiotic, can cause discoloration of teeth in children, making them appear blotchy. This is more and more uncommon now, as doctors realized that prescribing the medication to children could cause this reaction. Most drinking water has fluoride added to it, which is a good thing, because it helps to prevent cavities. However, if there is too much fluoride in the water, this could cause your teeth to turn yellow too. There are also some medical conditions which will make your teeth change color. In most cases, however, yellow teeth are caused by food, drinks, or tobacco staining the surface enamel of the tooth. Smokers almost always have yellow stained teeth, as well as people who drink large amounts of coffee. Soda and tea are also responsible. Although these are the main culprits, any type of food can stain your teeth if they are not properly brushed. Underneath your tooth enamel is a material called dentin. Dentin is naturally yellow, and as you age your tooth enamel becomes worn down, exposing the dentin. This is why some people notice a color change in their teeth as they grow older. Proper dental hygiene is one of the most important things you can do to prevent stained teeth. You should be brushing at least two or three times a day. Remember, the longer that a food or beverage remains in contacts with your teeth, the better chance you have of them turning yellow. Ideally, you would want to brush your teeth within an hour of eating or drinking anything that may stain them. You also need to remember to have dental cleanings at least once a year. Avoiding beverages that might stain your teeth is your best bet, but if you must have your soda, consider drinking it out of a straw and chasing it with a glass of water. This is perhaps the easiest method. All you need to do is swish it around your mouth for about a minute. However, these are usually only effective if your teeth are only very mildly stained because the whitening agents are only on your teeth for a short amount of time. There are many brands out there on the market. Again, for mildly stained teeth you might see an effect. These are best used as stain prevention, rather than stain removal. # Paint On BleachThese over-the-counter bleaching products look almost like nail polish. You simply "paint" your teeth with the bleach and let it sit. These have been shown to work on teeth that are not very badly stained. They can be somewhat messy, and you need to be sure not to miss parts of your teeth or they will be bleached unevenly. Also, some tooth sensitivity and gum discomfort is a common side effect. 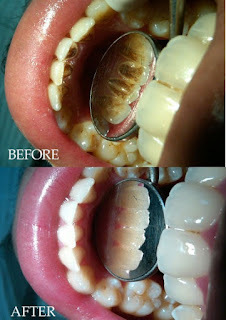 Bleaching trays are given to you by a dentist. They are typically molded to fit your mouth which allows the bleaching agent to more effectively coat each tooth. They also contain a higher concentration of the bleaching agent, so you get a brighter smile quicker. However, you might notice more side effects and you will be required to make at least one trip to the dentist. This is an effective option though, and can be a good option if your teeth are more than mildly stained. You can find many of these teeth-whitening salons in malls and office parks around the country. One popular company is Brite-Smile. These procedures use a combination of a hydrogen peroxide bleaching agent and blue-light technology. It takes about an hour, but many claim the effects are dramatic. There are also supposed to be fewer side effects than other methods, and the color change should last a few years. It costs between $400 and $600 dollars in most locations. Veneers are typically made from porcelain and are applied in thin layers on top of the tooth surface. This can be one of the most effective ways to get rid of your yellow teeth. First used to improve the look of movie star's teeth, veneers have been around for many years. Now anyone can get veneers, but there are some disadvantages. First, a dentist must do them for you, and they typically cost around a thousand dollars per tooth. They also only last around ten to fifteen years, and after that you will need to replace them. This can be quite an expensive option. Most insurance plans will not cover veneers which are done strictly to improve the look of yellow teeth. There are few side effects with veneers, but care must be taken by the dentist to make sure that the veneers fit properly in the mouth and that the bite is adjusted so that they do not become easily chipped. * Rub the white part of an orange peel along your teeth. * Brush your teeth with baking soda. * Using a Q-Tip, dab hydrogen peroxide onto the surface of your teeth, being careful to avoid your gums or you might have irritation. * Strawberry pulp is supposed to have a natural bleaching effect, and it tastes better than baking soda. * Salt can be used to brush your teeth. You can also try mixing salt, baking soda and water together. But be careful, because the salt is very abrasive and could cause mouth pain and weakened enamel. * Rinse your mouth with a vinegar/water solution. You should consult a dentist before trying and of the above remedies. Your tooth enamel is rather fragile, and you don't want to do too much to your teeth because it can really wear down the enamel, causing you even more problems. Remember, yellow teeth are really just a cosmetic issue and you don't want to cause permanent damage in your quest to have a bright smile. Tooth Whitening - How White Can They Be?